Definition at line 25 of file SquidString.h. Definition at line 38 of file SquidString.h. Definition at line 42 of file String.cc. Definition at line 49 of file String.cc. Definition at line 114 of file String.cc. References allocAndFill(), rawBuf(), and size(). Definition at line 32 of file SquidString.h. Definition at line 141 of file String.cc. Definition at line 212 of file String.cc. References buf_, clean(), len_, NULL, setBuffer(), and size_. Referenced by append(), and termedBuf(). Definition at line 103 of file String.cc. References allocBuffer(), assert, buf_, len, len_, PROF_start, and PROF_stop. Referenced by canGrowBy(), limitInit(), operator=(), reset(), and String(). Definition at line 22 of file String.cc. References assert, memAllocString(), PROF_start, PROF_stop, setBuffer(), and undefined(). Referenced by allocAndFill(), append(), and canGrowBy(). Definition at line 161 of file String.cc. References absorb(), allocBuffer(), assert, buf_, canGrowBy(), len, len_, PROF_start, PROF_stop, rawBuf(), size_, and xstrncpy(). Referenced by Adaptation::DynamicGroupCfg::add(), CapturingStoreEntry::append(), append(), Ftp::Gateway::buildTitleUrl(), Adaptation::Icap::ServiceRep::checkOptions(), Ipc::Port::CoordinatorAddr(), copy_cn(), Adaptation::ServiceGroup::finalize(), Rock::SwapDir::freeSlotsPath(), ftpListDir(), ftpReadCwd(), gopherToHTML(), Ftp::Gateway::handleControlReply(), StoreEntry::hasOneOfEtags(), httpHeaderParseQuotedString(), Ipc::Port::MakeAddr(), MetadataId(), Ipc::Mem::Segment::Name(), HttpHdrCc::noCache(), Rock::SwapDir::parse(), HttpHdrCc::parse(), HttpHdrCc::Private(), QueuesId(), ConfigParser::QuoteString(), ClientHttpRequest::rangeBoundaryStr(), ReadersId(), HttpReply::removeStaleWarningValues(), strListAdd(), and termedBuf(). Definition at line 190 of file String.cc. Definition at line 197 of file String.cc. Definition at line 206 of file String.cc. References append(), len_, and rawBuf(). Definition at line 123 of file SquidString.h. References allocAndFill(), allocBuffer(), CanGrowTo(), cut(), setBuffer(), size(), substr(), and sz. Referenced by append(), HttpStateData::httpBuildRequestHeader(), and strListAdd(). Whether creating a totalLen-character string is safe (i.e., unlikely to assert). Optional extras can be used for overflow-safe length addition. Implementation has to add 1 because many String allocation methods do. Definition at line 121 of file SquidString.h. Definition at line 299 of file String.cc. References nilCmp(), size(), and termedBuf(). Referenced by caseCmp(), DelayTaggedCmp(), Adaptation::Config::dumpService(), Adaptation::Icap::ServiceRep::finalize(), Mgr::QueryParams::find(), Ftp::Server::handleEpsvRequest(), Http::StatusLine::parse(), HttpHdrRange::parseInit(), Http::One::Server::processParsedRequest(), termedBuf(), and HttpReply::validatorsMatch(). Definition at line 309 of file String.cc. References len_, memStringCount(), nilCmp(), ptrcmp, rawBuf(), Mgr::RegisterAction(), size(), size_, storeAppendPrintf(), and termedBuf(). Definition at line 114 of file SquidString.h. References caseCmp(), rawBuf(), and size(). Definition at line 125 of file String.cc. 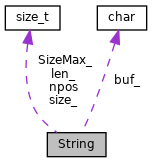 References buf_, defined(), len_, memFreeString(), NULL, PROF_start, PROF_stop, and size_. Referenced by absorb(), StoreEntry::adjustVary(), authDigestLogUsername(), HttpRequest::clean(), HttpHdrScTarget::clearContent(), HttpHdrCc::clearNoCache(), HttpHdrCc::clearPrivate(), clientFollowXForwardedForCheck(), clientInterpretRequestHeaders(), Ssl::ErrorDetail::cn(), Auth::SchemeConfig::done(), Ipc::TypedMsgHdr::getString(), gopherToHTML(), HttpReply::hdrCacheClean(), httpHeaderParseQuotedString(), httpMakeVaryMark(), limitInit(), operator=(), HttpHdrCc::parse(), ConfigParser::QuoteString(), reset(), clientReplyContext::restoreState(), MemObject::setUris(), termedBuf(), HttpReply::validatorsMatch(), Ftp::Gateway::~Gateway(), and ~String(). Definition at line 269 of file String.cc. Referenced by testConfigParser::doParseQuotedTest(), Ftp::Server::handleEpsvRequest(), operator!=(), operator<(), operator==(), Http::StatusLine::parse(), HttpReply::sanityCheckStartLine(), termedBuf(), testString::testCmpDefault(), testString::testCmpEmptyString(), and testString::testCmpNotEmptyDefault(). Definition at line 279 of file String.cc. Definition at line 289 of file String.cc. Definition at line 236 of file String.cc. Referenced by canGrowBy(), clientFollowXForwardedForCheck(), and Adaptation::ServiceGroup::finalize(). Definition at line 154 of file SquidString.h. Definition at line 134 of file SquidString.h. Referenced by clean(), and undefined(). Definition at line 522 of file String.cc. References npos, NULL, pos(), and rawBuf(). Referenced by Adaptation::ServiceConfig::grokUri(), strListIsSubstr(), and termedBuf(). Definition at line 532 of file String.cc. Definition at line 94 of file String.cc. Referenced by ESIVarState::addVariable(), authDigestLogUsername(), ESISegment::dumpOne(), Ipc::TypedMsgHdr::getString(), Adaptation::ServiceConfig::grokUri(), HttpReply::hdrCacheInit(), httpHeaderParseQuotedString(), HttpHeaderEntry::parse(), parseBytesOptionValue(), CacheManager::ParseHeaders(), SBufToString(), Adaptation::DynamicServiceChain::Split(), substr(), and termedBuf(). Definition at line 84 of file String.cc. Definition at line 59 of file String.cc. Definition at line 66 of file String.cc. References allocAndFill(), clean(), rawBuf(), and size(). Definition at line 43 of file SquidString.h. References buf_, len_, operator!=(), operator==(), and size_. Definition at line 75 of file String.cc. Retrieve a single character in the string. aPos Position of character to retrieve. Definition at line 62 of file SquidString.h. References assert, buf_, and size_. Definition at line 498 of file String.cc. References NULL, termedBuf(), and undefined(). Referenced by Http::ContentLengthInterpreter::checkField(), esiEnableProcessing(), find(), and termedBuf(). Definition at line 506 of file String.cc. Definition at line 76 of file SquidString.h. References INT_MAX, Must, and size(). Referenced by Ipc::TypedMsgHdr::putString(), and HttpReply::sanityCheckStartLine(). Definition at line 85 of file SquidString.h. Referenced by append(), authDigestLogUsername(), clientReplyContext::buildReplyHeader(), caseCmp(), Http::ContentLengthInterpreter::checkField(), Http::ContentLengthInterpreter::checkList(), clientCheckPinning(), ESIVariableExpression::eval(), ESIAssign::evaluateVariable(), find(), free_access_log(), gopherToHTML(), Adaptation::ServiceConfig::grokUri(), httpFixupAuthentication(), Adaptation::Icap::ModXact::makeRequestHeaders(), Adaptation::Ecap::XactionRep::masterxSharedValue(), operator<<(), operator=(), ESIAssign::process(), Ipc::TypedMsgHdr::putString(), ESIVarState::removeVariable(), rfind(), String(), StringToSBuf(), substr(), and Adaptation::Ecap::XactionRep::usernameValue(). Definition at line 151 of file String.cc. References allocAndFill(), clean(), PROF_start, and PROF_stop. Referenced by ftpReadCwd(), operator=(), and termedBuf(). Definition at line 542 of file String.cc. References npos, NULL, rawBuf(), and rpos(). Definition at line 514 of file String.cc. Referenced by rfind(), and termedBuf(). Definition at line 144 of file SquidString.h. Definition at line 148 of file SquidString.h. Definition at line 34 of file String.cc. References assert, buf_, size_, SizeMax_, and undefined(). Referenced by absorb(), allocBuffer(), and canGrowBy(). Definition at line 72 of file SquidString.h. Referenced by ESIAssign::addElement(), HttpHeader::addEntry(), StoreEntry::adjustVary(), Format::Format::assemble(), authDigestLogUsername(), canGrowBy(), caseCmp(), Adaptation::Icap::Options::cfgIntHeader(), Http::ContentLengthInterpreter::checkField(), Http::ContentLengthInterpreter::checkList(), CacheManager::CheckPassword(), clientFollowXForwardedForCheck(), clientProcessRequest(), cmp(), Ssl::ErrorDetail::cn(), ErrorState::compileLegacyCode(), Ftp::Gateway::completedListing(), Adaptation::Icap::Options::configure(), Ipc::Port::CoordinatorAddr(), copy_cn(), copyOneHeaderFromClientsideRequestToUpstreamRequest(), copyResultsFromEntry(), HttpHeader::delAt(), Auth::SchemeConfig::dump(), ErrorState::Dump(), ESIVariableExpression::eval(), ESIAssign::evaluateVariable(), Adaptation::Icap::ModXact::expectIcapTrailers(), Mgr::Action::fillEntry(), Adaptation::ServiceGroup::finalize(), Mgr::QueryParams::find(), HttpHdrSc::findTarget(), free_access_log(), Mgr::QueryParams::get(), AccessLogEntry::getExtUser(), HttpHeader::getList(), Adaptation::History::getXxRecord(), gopherToHTML(), Adaptation::ServiceConfig::grokUri(), Ftp::Server::handleEprtRequest(), Ftp::Server::handleEpsvRequest(), Ftp::Server::handlePasvRequest(), Ftp::Server::handlePortRequest(), HttpHdrCc::hasNoCacheWithoutParameters(), HttpHdrCc::hasNoCacheWithParameters(), HttpHdrScTarget::hasTarget(), MemObject::hasUris(), HttpStateData::httpBuildRequestHeader(), httpFixupAuthentication(), DelayTagged::id(), HttpHeader::insertEntry(), MemObject::logUri(), Adaptation::Icap::ModXact::makeRequestHeaders(), Adaptation::Icap::ModXact::makeUsernameHeader(), Adaptation::Ecap::XactionRep::masterxSharedValue(), ACLExtUser::match(), Ipc::Mem::Segment::Name(), HttpHdrCc::noCache(), operator<<(), operator=(), HttpHdrCc::packInto(), Adaptation::ServiceConfig::parse(), Mgr::QueryParams::Parse(), Ssl::ErrorDetailFile::parse(), Http::StatusLine::parse(), HttpHdrCc::parse(), Adaptation::Icap::ModXact::parseIcapHead(), Dns::LookupDetails::print(), HttpHdrCc::Private(), ESIAssign::process(), psize(), Ipc::Coordinator::registerStrand(), HttpReply::removeStaleWarnings(), HttpReply::removeStaleWarningValues(), ESIVarState::removeVariable(), HttpReply::sanityCheckStartLine(), statClientRequests(), clientReplyContext::storeId(), MemObject::storeId(), HttpRequest::storeId(), storeLog(), strHdrAcptLangGetItem(), String(), StringToSBuf(), strListAdd(), substr(), testEvent::testDump(), Mgr::QueryParams::unpack(), Adaptation::Ecap::XactionRep::usernameValue(), HttpReply::validatorsMatch(), Adaptation::Ecap::HeaderRep::value(), and Ftp::Server::writeErrorReply(). The absolute size limit on data held in a String. Since Strings can be nil-terminated implicitly it is best to ensure the useful content length is strictly less than this limit. Definition at line 70 of file SquidString.h. Definition at line 223 of file String.cc. References limitInit(), Must, rawBuf(), and size(). Referenced by canGrowBy(), Adaptation::ServiceConfig::grokUri(), Mgr::QueryParams::Parse(), Mgr::QueryParams::ParseParam(), strHdrAcptLangGetItem(), and testString::testSubstr(). Returns a raw pointer to the underlying backing store. The caller requires it to be null-terminated. Definition at line 91 of file SquidString.h. References absorb(), append(), buf, buf_, caseCmp(), clean(), cmp(), find(), len, limitInit(), pos(), reset(), rfind(), and rpos(). Referenced by aclMatchExternal(), Mgr::ActionParams::ActionParams(), addedEntry(), StoreEntry::adjustVary(), Format::Format::assemble(), assembleVaryKey(), clientReplyContext::buildReplyHeader(), ConnStateData::buildSslCertGenerationParams(), caseCmp(), Adaptation::Icap::Options::cfgIntHeader(), clientFollowXForwardedForCheck(), clientInterpretRequestHeaders(), IpcIoFile::close(), cmp(), Ssl::ErrorDetail::cn(), ErrorState::compileLegacyCode(), Ftp::Gateway::completedListing(), Ipc::Mem::Segment::create(), CacheManager::createRequestedAction(), Mgr::Action::createStoreEntry(), Adaptation::Icap::Xaction::dnsLookupDone(), testConfigParser::doParseQuotedTest(), Auth::SchemeConfig::dump(), ErrorState::Dump(), Mgr::Action::fillEntry(), Adaptation::Icap::Xaction::finalizeLogInfo(), Adaptation::Icap::ModXact::finalizeLogInfo(), Adaptation::Ecap::FindAdapterService(), HttpHdrSc::findTarget(), Rock::SwapDir::freeSlotsPath(), HttpHeader::getContRange(), HttpHeader::getETag(), AccessLogEntry::getExtUser(), HttpHeader::getLastStr(), HttpHeader::getList(), HttpHeader::getStr(), HttpHeader::getTime(), HttpHeader::getTimeOrTag(), Adaptation::ServiceConfig::grokUri(), ClientHttpRequest::handleAdaptationBlock(), Client::handleAdaptationBlocked(), Ftp::Server::handleEprtRequest(), Ftp::Server::handlePortRequest(), HttpHeader::hasNamed(), StoreEntry::hasOneOfEtags(), HttpStateData::httpBuildRequestHeader(), httpFixupAuthentication(), httpHeaderParseQuotedString(), TemplateFile::loadDefault(), MemObject::logUri(), Adaptation::Icap::ModXact::makeUsernameHeader(), ACLMyPortNameStrategy::match(), ACLTagStrategy::match(), ACLExtUser::match(), Ipc::Mem::Segment::Name(), Ipc::Mem::Segment::open(), IpcIoFile::open(), Adaptation::Icap::Xaction::openConnection(), LoadableModule::openModule(), Adaptation::ServiceConfig::parse(), Ssl::ErrorDetailFile::parse(), Rock::SwapDir::parse(), HttpHeaderEntry::parse(), Auth::SchemeConfig::parse(), parse_HeaderWithAclList(), parseBytesOptionValue(), HttpHdrRange::parseInit(), Mgr::QueryParams::ParseParam(), pos(), prepareLogWithRequestDetails(), Ftp::PrintReply(), ConfigParser::QuoteString(), HttpReply::removeStaleWarnings(), HttpReply::removeStaleWarningValues(), Mgr::Response::Response(), rpos(), Log::Format::SquidIcap(), statClientRequests(), clientReplyContext::storeId(), MemObject::storeId(), storeLog(), strListGetItem(), CommonPool::theClassTypeLabel(), TemplateFile::tryLoadTemplate(), Adaptation::Ecap::UnregisterAdapterService(), Adaptation::Ecap::HeaderRep::value(), and Ftp::Server::writeErrorReply(). Definition at line 135 of file SquidString.h. Referenced by allocBuffer(), pos(), rpos(), and setBuffer(). Definition at line 146 of file SquidString.h. Referenced by absorb(), allocAndFill(), append(), clean(), cut(), cutPointer(), defined(), operator=(), operator(), rawBuf(), set(), setBuffer(), and termedBuf(). Definition at line 140 of file SquidString.h. Referenced by absorb(), allocAndFill(), append(), caseCmp(), clean(), cut(), cutPointer(), operator=(), and size(). Definition at line 39 of file SquidString.h. Referenced by find(), Adaptation::ServiceConfig::grokUri(), rfind(), and strListIsSubstr(). Definition at line 138 of file SquidString.h. Referenced by absorb(), append(), caseCmp(), clean(), operator=(), operator(), and setBuffer(). Definition at line 142 of file SquidString.h. Referenced by setBuffer(), and SizeMaxXXX().